In the Spring of 2015, the Graduate Institute hosted Raúl García-Heras, an Argentine historian specialized in business and economic history of modern and contemporary Argentina. Mr García-Heras was the fourth Pierre du Bois Visiting Professor at the International History Department. At the Graduate Institute, Mr García-Heras taught a graduate seminar on Argentina’s import-substituting industrialization. The course compared Argentina’s national experience with those of Brazil and Mexico up until the mid-1970s. Mr García-Heras also offered a seminar paper on his current research project on the role of the main international banks involved in the financing of Argentina’s economic stabilization and development needs. In his normal capacity, Mr García-Heras is Assistant Professor of economic history at the School of Economics of the University of Buenos Aires, as well as a senior researcher in Argentina’s National Scientific Research Council (CONICET). After his undergraduate studies in History and English Language and Literature, he completed a doctorate in economic history at the University of La Plata, Argentina. His research fields are the history of foreign business and of economic policy-making in modern and contemporary Argentina. In the 1990s, Mr García-Heras contributed to the early professional development and institutionalization of business history as a specialized field in Argentina. He currently teaches undergraduate courses on the social and economic history of Argentina and is a member of the Editorial Board of “Anuario” of business history studies, which is based at the Centro de Estudios Económicos de la Empresa y el Desarrollo (CEEED) of the University of Buenos Aires. In his doctoral dissertation, Mr García-Heras studied the influence of British-owned railways in Argentina during the 1930s and the early 1940s. His first postdoctoral project was a book combining business an urban history approaches about the main tramway company in Buenos Aires. It was published in Spanish in 1994. Subsequently, Mr García-Heras tackled a survey of the controversial involvement of the World Bank and the International Monetary Fund in Argentina until the late 1960s that also came out as a book in Spanish in 2008. He is currently writing a book about the role of US and West European international banks in the financing of Argentina’s economic development and stabilization policies during the Bretton Woods era. 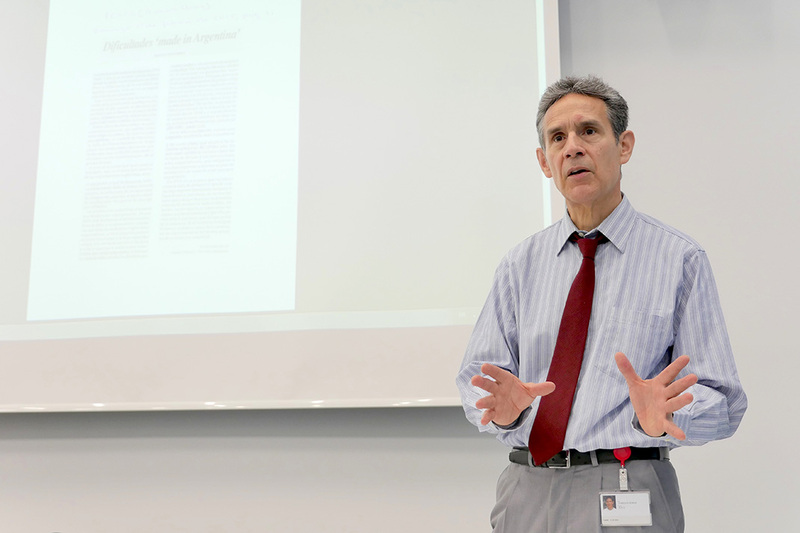 During his stay in Geneva, Mr García-Heras also prepared a paper entitled The Return of International Finance and the Origins of the Martínez de Hoz Economic Plan in Argentina, which he will present in Octorber 2015 at the conference “Debt, Inflation and Business in Latin America in the 1970s and 1980s, 6th-7th October 2015,” in Lima, Peru. “Macroeconomic Stabilization, Economic Development and Banking International Finance: The Argentine Case during the Bretton Woods Era,” 3 March 2015. See Prof. García-Heras’ CV here.